Dumfries Cricket Club started their cricket season last Saturday with a flow of runs against Ferguslie in the sun at Nunholm. They achieved their objective of comprehensive warm-up with a 188 run win in a precursor to the league season. The visitors Ferguslie were not close to full strength. That included one of their number being stranded abroad by some volcanic ash. Instead it was Dumfries batting first that provided the pyrotechnics as they started at a run a ball. Tom McBride hit a series of boundaries as he hurried to 33 before being caught behind by the wicket-keeper. Russell Johnston was more circumspect and he played second fiddle while Scott Beveridge provided the fireworks. The pair marked their hundred partnership in the 24th over when the score passed one hundred and fifty. Beveridge gradually turned up the heat during his innings including hitting 20 in one over off one unfortunate bowler. Johnston was grounded when he was retired undefeated on 62 with the score on 195 and Beveridge might have gone the same way except that he rapidly started approaching a century. 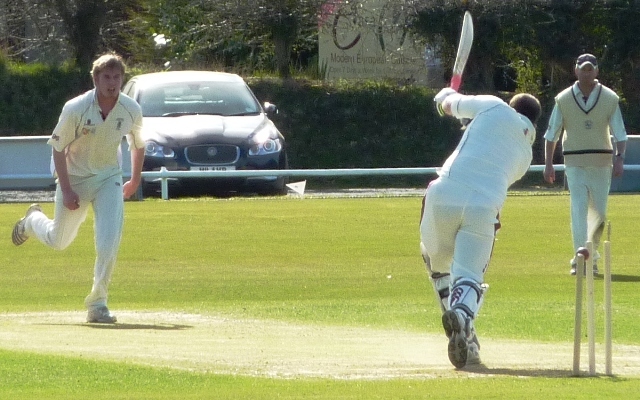 However it wasn’t to be as opener McAllister swapped to operating round the wicket and found his stride. He claimed Beveridge, lbw, five short of his century with the score on 210. He had found the hotspot and had hit 4 sixes and 11 fours to claim the Site Electrical Man of the Match award. McAllister went to take 4 wickets as Dumfries sought to maintain the run rate of seven an over. They finished the 40 overs on 288 for 5, Josh Geary not out on 27. Ferguslie needed to start with a bang but Robert McBride bowled out Mories cheaply in his third over. He took another a couple of overs later and Nunholm bred David Sturgeon was bowled as Maskrey hooped one past his defences. Jerry Goodin demonstrated the lethal threat of a looping full toss with his second ball to take a caught and bowled and Ferguslie were 27 for 4. Nye and Kennedy stabilised the innings but the contest was over. Dumfries circulated through eight bowlers. Geary broke the partnership on 68 and Davidson, Dawson, with two, shared wickets and Beveridge had Kennedy caught for 33. The last wicket fell on exactly 100 with just over one over left. In the first game of the season both sides spurned the catches that went airborne. However a different contest can be anticipated when the two sides meet again on the 1st of May in Paisley in the first league match of National League Division 2. The weather for the Sunday contrasted and heavy bursts of rain at Nunholm put paid to the match against Hillhead but not before Scott Beveridge found the boundary ten more times before he finally managed to get himself caught for 59. The reduced match of 30 overs was abandoned with Dumfries on 111 for 3 off 14 overs. It appears the IPL on ITV4 is having an impact. Site Electrical Man of the Match: Scott Beveridge. Tom McBride has been selected in the Western Warriors squad for the Cricket Scotland Regional series. The West side play the East this Sunday in Edinburgh. This new competition is designed to allow the country’s top cricketers to stake their claim for selection to the national squads. This weekend JMS Nunholm start their league season in Western Union Division 2 on Saturday with a home match against Bothwell. On Sunday the visitors are Edinburgh Premier League side Carlton who are making a welcome return to Nunholm for a pre-league season friendly. More information on the club can be found at www.dumfriescricketclub.co.uk.